Annual hanging baskets are very popular especially for decorating porches and patios. 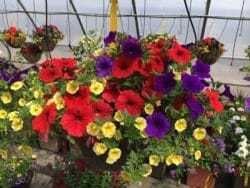 Pre-planted annual hanging baskets for sunny or shady locations are a Creek Side Gardens specialty where nothing says color in your life better than big, strong, colorful annual flowers that will bloom constantly all summer long. With an experienced eye for color and form, utilizing the thriller, filler, spiller design concept, combinations of colorful annuals are planted together into containers ranging from 12 inches to more than 22 inches in diameter. You will be amazed with our creations when you come to visit. Check out our Grown Fresh GuaranteeTM. Great annual plant genetics. By this we mean that the superior performance of these flowers is built into the plant itself. Creek Side searches through all the flower breeder catalogs and selects just the very best varieties for Colorado gardeners. Our warm, dry growing climate requires our annual plants to possess genetic vigor to withstand our sometimes harsh growing conditions throughout the summertime. Most often these varieties are reproduced from cutting clones rather than seeds. This ensures that the genetics of the plant stay true to their expected performance levels. You’ll find the very best annual varieties for Colorado growing at Creek Side Gardens. Plants manufacture their food to grow from the sunshine through a process call photosynthesis. No sun, no growth. Colorado has lots of sunshine! Water, water, water. Along with all the great sunshine that Colorado has to offer, comes the warm temperatures. The warmer the temperature, typically the faster a plant dries out especially during the summer months. Great care is taken to ensure that all the annual plants at Creek Side Gardens are watered regularly! In addition to the sunshine and water, plants require a few extra building blocks in the form of nutrient fertilizer. When we water regularly, we wash plant nutrients out of the container. If we replenish these nutrients regularly we can double the flower power of the plant and extend the life to the very end of the season. Ask our Green Team experts which fertilizer is best for you. Hanging baskets are a good gardening option, particularly for gardeners with limited space. Because hanging baskets are more exposed to air movement, extra care is recommended to prevent the baskets from drying out too quickly. In addition to the pre-planted combination hanging baskets, Creek Side is excited to offer the individual plants, potting soil and containers to fulfill our guests own imaginations.